Started on this one yesterday to check out how hammer works, and i ended up trying to create a TTT map based on the movie "The Bunker"
I have no experience with hammer, but I'm quite proud of what i've done so far. Any suggestions, advice and helpfull criticism is welcome. You and your fellow comrades are holed up in an old German bunker, deep inside enemy territory. After a few heavy firefights and mortar strikes, you and your comrades hear voices, deep inside the tunnels. American spies? Maybe. Up to you and your comrades to find that out. Watch eachothers backs and listen to your Truppenfuhrer* to find out whom is the real spy, and whom is your fellow, innocent comrade. The point of the map is a unfinished, German bunker with a dark history. Traitors can either silently assassinate innocents in dark, narrow passages or decide to go in, guns blazing. Entrance to the lower levels of the bunker, quite unclear right now will be improved towards the first alpha. Looks good,Nice detail work also. It looks ok, but you use way too much same looking textures for everything. That makes it look really dull and ugly, because everything seems to be made out of same material. Use this as example how to make better looking doorways. Also, please, use light spot to make much more polished looking lightning. Thanks for the advice Wilson. 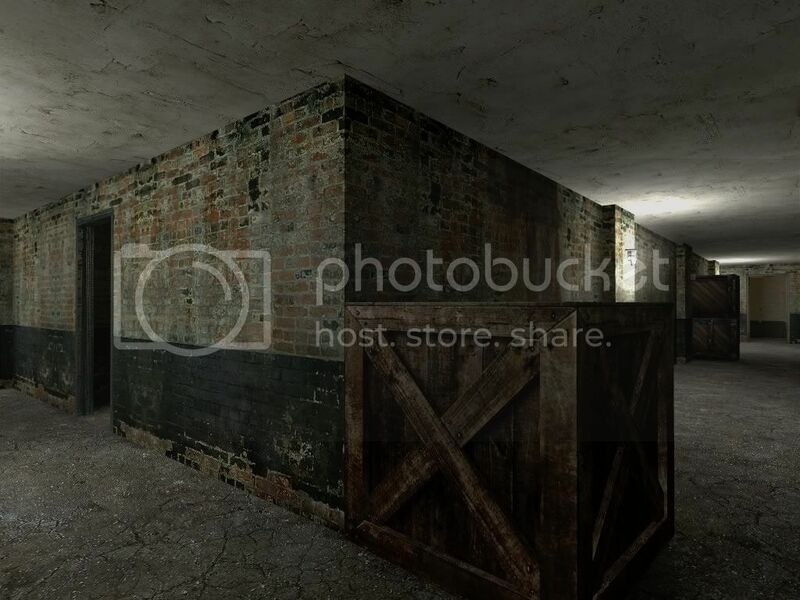 Just keep in mind that it's supposed to be a bunker, and most WWII bunkers were made out of concrete, but I'll change the textures to something that looks better, and still suits the theme. I'll post some pictures of the changes soon. Looking good so far, just don't make things too dark. The main tunnels will be lightened up pretty well, but I'll scatter a few generators around, and traitors can turn them off the darken parts of the bunker. Maybe also the possibility to blow them up with explosives to shut down lights for good.